"TEXSTARE3" LEADED GLASS DOOR AND TWO VERTICAL BEVEL SIDELIGHT WINDOWS CUSTOM AT GLASS BY DESIGN. 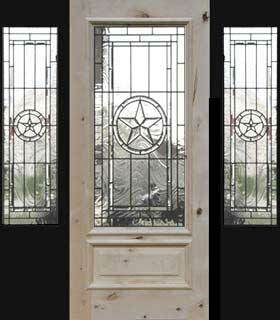 Door and 2 sidelights with Texas Star leaded glass bevel windows. The price for this design custom made to your dimensions would be $205 per square foot. This wood was knotty alder, but you may choose most any wood.